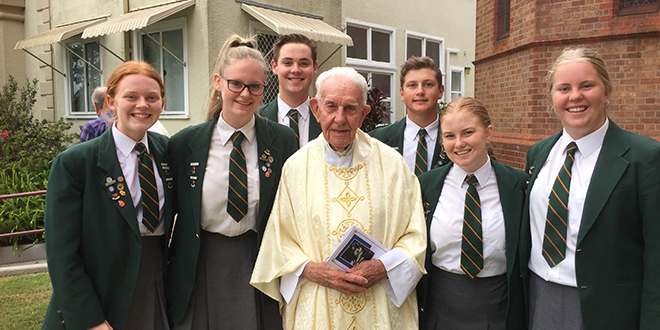 Australian honour: Marist Father Paul Pidcock with students from St John College, Woodlawn, and below left, celebrating Mass. STUDENTS and staff at St John College, Woodlawn, are busy settling into the new school year but someone special is missing. Eighty-seven-year-old Fr Paul Pidcock is not among them this time, for the first time in about 60 years. He’s in Sydney, having retired from the college late last year. As he adjusted to the idea of not returning to Woodlawn for another school year, news broke that he’d been named on the Australia Day honours list. The Marist Father, 62 years a priest, was awarded a medal of the Order of Australia for service to the Catholic Church. “I was surprised I was nominated, really,” Fr Pidcock said. “I see it as an acknowledgement of the importance of Catholic education. Fr Pidcock has spent much of his life at Woodlawn, having started there as a boarding student in 1944 when the college was run by the Marist Fathers and then joining the staff in 1957 after being ordained for the order the previous year. Apart from a stint at Marist Regional College at Burnie, in Tasmania, Fr Pidcock has served most of his priestly life at Woodlawn – as teacher, spiritual director and musical director (1957-71), bursar (1979-2000) and chaplain (2000-18). “The Marists withdrew (from Woodlawn) in 2001 but I was asked to stay on as a chaplain,” he said. That was around the time the college transitioned to a co-educational school. “I’ve seen lots of developments and changes and progress,” he said. “They had a great farewell for me up there. “Over 400 came to a farewell Mass (at the college). That was great way to finish up. “I really loved the work I did … (and) I had a varied and enriching time at the college. Apart from serving at the college, Fr Pidcock also was a part-time chaplain at Grafton Correctional Centre for more than a decade. As a member of the Marist Fathers’ Hunters Hill community, Fr Pidcock said he would be “helping out in the parish” at St Patrick’s, Church Hill, in the heart of Sydney. “I’m 87, and my health’s really good, I’ve still got my driver’s licence,” he said. Federal Member for Page Kevin Hogan paid tribute to Fr Pidcock in Parliament in October last year at the time of the priest’s retirement. “My children went to Woodlawn and I’ve had many interactions with him as both a parent and an MP,” Mr Hogan said.